Josh Smith has a heck of a night on Friday against the 76ers, but he was the hero of the Palace when he scored the winning layup with 1.2 seconds left on the clock to give the Pistons the win against the Suns 110-108. 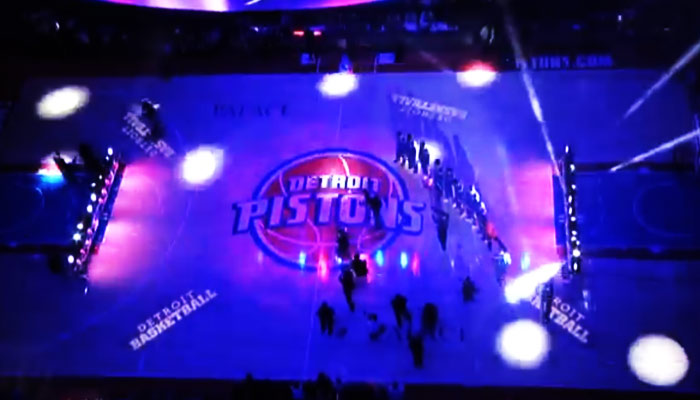 It was a frustrating night at the Palace for Pistons fans who watched Detroit lose an 18 point second half lead that gave way to the Suns knocking down open threes late in the fourth quarter. What’s even worse is Detroit led by three points 108-105 with 26 seconds on the clock on a Josh Smith three pointer only to have the Suns tie it up when Smith fouled Gerald Green on the other end to send him on to for three foul shots that he made to tie it with 4.3 on the clock. Smith finished with 25 on 11-of-16 shooting with 11 boards, five assist and a blocked shot. Sheed, who did the post game interview at the Palace, reiterated that Josh said in the huddle as they were mapping out the last play the he wanted to make basically make up for his miss in New York. 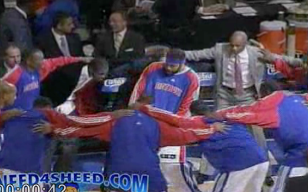 It wasn’t more than 15 minutes after the buzzer has ended and Sheed was in his Pistons sweats and his Air Force One’s. Brandon Jennings had a heck of a night. Jennings tied Isiah Thomas’ franchise record with 16 assists in the first half of the game. Jennings finished the game with 18 assists, a career high, adding eight points and eight boards. Smith, Drummond and Monroe with double-doubles. Greg Monroe scored 20 points with 12 boards, four assists and a steal. Andre Drummond 13 points, 13 boards and five blocked shots. Dre looks like he’s making a point of blocking every shot that comes his way. This dunk from what was clearly the most exciting assist on the night from Jennings, brought the house down. Was wondering why Cheeks didn’t have either Monroe or Drummond in the game when it counted to grab boards? I know the Suns had a small lineup out there, but Detroit couldn’t get a board to save their life in when the big fella’s weren’t out there. The Suns tried the Hack-A-Dre. When they sent Andre to the line and he made the first one, he glared at Phoenix’s bench. No words were needed to know what Andre was saying, it’s just too bad he didn’t make them both. Can’t let Barbosa, who the Suns just signed on the 10 day contract, get wide open threes late in the game. Will Bynum with 16 points on 6-of-11 shooting with one assist in 23 minutes. Bless Will, but he’s got to pass first instead of try to do everything himself when he’s out there. Singler with cringe-worthy 6 turnovers, most of them coming as the Suns where edging their way back. Singler finished with six points on 3-of-9 shooting, adding eight boards. It’s clear Rodney Stuckey isn’t back to true form yet. He finished with eight points in 20 minutes. 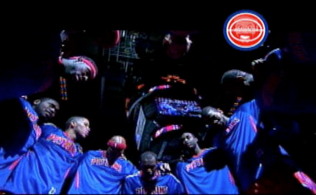 It’s funny how many people who go to Pistons games have no idea what’s going on. The girl behind me asked the guy she was with why Tayshaun Prince wasn’t playing. The three-point line needs help, both offensively and defensively. The Suns were 13-35 from downtown, while Detroit was just 3-of-17 for a lowly 17.6%. An extended break for Detroit, who don’t play again until Friday at the Palace against the Jazz. 12 Responses to "The Pistons Need A Last Second Shot From Josh Smith For The Win"
I’m one of those that said never sign him and get rid of him. But if he plays like this he’s a great player! I want the “Good Josh Smith”. Our record however, tells you how often we have the “Good Josh Smith”. 16-22 means most of the games we get the “Bad Josh Smith”. Will we get more “Good Josh Smith” ? It’s a mystery. If you want “good” Josh Smith to make more appearances, you need to put him in a position to be successful. Specifically the power forward position. Paying him $54 million to play small forward is one of the most psychotic things happening in the NBA right now. See also: Preparing to pay Greg Monroe even more money to play out-of-position alongside him. Natalie, I appreciate that the narrative reflects a pretty disappointing win and the sad state of affairs in Detroit. I don’t want to denigrate the Suns here, but the fact that we’re going small to match up with them should terrify everyone. Not saying they should be taken lightly, but we’ll see how good they really are by the end of the season. They’re definitely playing at least a bit over their heads, and it’s hard to call this a “quality” victory. Oh well, I’m getting burnt out on this team. They’re bad and they don’t seem to have a shred of interest in getting any better. Just overpay Monroe, let Stuckey waltz for nothing, and come back with no draft pick and no hope. By the time Dumars’ contract expires, it’ll be too late to salvage our tradeable assets and actually have a chance at a real future. k c u l8r. It would be nice to quit this team, but I think I’m in it for another year even if it means suffering. But the thing is, there is no “another year.” The Jumbo mess isn’t working, so the trade deadline is D-Day. We already know this. There isn’t the same light at the end of the tunnel that there was for the past four years. The light dies once we let Stuckey walk in free agency (losing him for nothing when he would have been a terrific trade chip a month ago) and go all-in on a formula that we’ve already seen doesn’t work. Ten million bucks in cap space is barely going to replace Stuckey, let alone have enough impact to legitimately transform this team that has already established itself as bad. I’ll keep an eye on them through the next month, but once the deadline passes I can tell you right now that for the foreseeable future the team is going to look pretty much exactly like it does now. anyone who thought this team would come together and hit the floor on all cylinders was wrong (and unrealistic), and anyone who thinks this Piston team wont be a force to reckon with soon enough is also wrong. Building a team takes time and the past few years dont count as team building. Josh Smith will be fine at the three, and Monroe is great at the four. Detroit is lacking reliable 3 point shooting, but Pope is showing growth and Singler is getting a rhythm. The cherry on this season would be a trade for a lights out pure shooter to stretch the floor. Sell Stuck while he’s hot and add JJ to sweeten the pot. I like Jerebko but he deserves better than to rot at the end of the Pistons bench. I still think Detroit makes the playoffs this year and the best case scenario would be for the Pistons to get in at around the 6th seed play a hard fought battle and lose in 6 in a game they should have won, then fire Cheeks and lure in a guy like George Karl or lure Larry Brown out of college. I blame a lot of these losses on coaching as much as i hate to say it this time. I was kinda pulling for Mo, but im not seeing a good fit with his “system” or lack there of. big lineup isn’t working, josh, greg & dre. But Andre Drummond should have been a #2 or even #1 pick. He is a star you can build a team around. Greg Monroe is incredibly talented and has improved his game every year. Brandon Jennings while he has plenty of flaws (like his pick & roll defense, he gets stuck on a pick like it’s glue) is a tremendous upgrade over the other brandon, Jennings should be sufficient to take this team deep into the playoffs. Coach Mo will eventually give up on Josh Smith at the 3, unfortunately that doesn’t leave the right amount of minutes for Greg, so I assume he is going to get traded for a talented small forward that can defend the perimeter and shoot the 3. KCP is our best defender at the guard position, but he has been a terrible shooter. Not sure what is up with that, even if he never develops his shot in the NBA he is our future at shooting guard. If you look at our past, this team has plenty of talent to make a nice little run into the playoffs. Andre Drummond and Greg Monroe together have had a lot of difficulty on defense, but they are improving. Josh Smith has been terrible at the perimeter defense this will get better as Coach Mo plays him at power forward. Singler is quietly having his best year in the NBA. It might be enough to just run this lineup, Jennings, kcp, singler, josh and drummond, bring greg monroe off the bench. Greg will be angry and that’s no way to treat a player you want to keep, but that’s Joe D’s job to keep Greg here. He’s the guy that decided let’s play someone who is horrible at the 3 instead of his natural position of power forward. Coach Mo’s job is to win games he can’t worry about whether or not Greg will want to walk if he gets put on the bench. Jorts is also a great player, he is playing miles above the level of his contract. Joe D has a real talent of finding 2nd level draft players, finding under used players in the NBA. Joe’s problem of course is any time he has a bit of money in his pocket to spend, he can’t wait, he has to spend it now, that’s how we got Ben Gordon, Charlie V and Josh Smith. Just could not wait. It would have made way too much sense to let Josh Smith sign with another team and then trade for him later. Joe D’s career is going to be decided by this Josh Smith experiment. I doubt we will trade any of our big pieces. He might clear out some of our point guards, Billups I assume will stay just because, but we have Siva, Bynum, Stuckey, Billups Jennings that’s too many guards. We also have too many bigs, Jorts, Josh, Greg, Drummond. And we don’t really have a decent small forward for our starting lineup at all. Josh Smith can sometimes play good basketball but he has probably the 2nd lowest basketball iq in the NBA (just behind JR Smith). Things he does like passing to the other team, knocking over a 3 point shooter, he does this sort of stuff every game. It worries me that this Piston’s team is going to become Josh Smith’s team, where we win or lose according to how Josh plays. He’s just not that smart to be able to be the leader. I’d rather have Greg Monroe as our leader. Such a high basketball iq, always knows what is going on. Not the athletic freak that Josh is but basketball is not all about who can jump the highest, you have to be smart. Potential. That’s the basic message this team has a lot of potential. And to make the most of it, the onus is not on the players but on Coach Mo an Joe Dumars. Terry, this team could stay together for seventy-five years and never develop into a force to be reckoned with. The Jumbo Three do not fit, and even this lost, pathetic organization has figured that out. It took too long, but they’ve finally decided to trend away from to playing all of them together. Unfortunately, they’ll tinker and tinker until all of their flexibility has shriveled up drier than my nanna’s uterus. Stuckey won’t be traded and will be lost for nothing whatsoever. Worse yet, the team will be stupid enough to match whatever ludicrous contract someone (who actually NEEDS a center) throws at him, and we’ll be locked into this losing formula for several more years. Ten million dollars isn’t going to bring in enough perimeter talent to save this from being a below average team as long as these are your main pieces. I wish it weren’t so, but better to face reality than live in denial forever. I promise. Man, you sure typed a lot of words. And yet I’m 100% sure “It isn’t working. Major roster changes are in order or we’re going to be bad for a very long time” would have summed it up more accurately.